After hosteling for a couple years, I have always been envious of the German or British people who are traveling for months at a time. As Americans, we never really get that chance except for studying abroad. When I got hired for my first “real” job in February, I was told that I would start in September. This would be my only chance to do such a long trip unless I got fired (in which case I would probably want to look for another job instead of traveling) or if I somehow made it and retired early. Since I plan on having a long career and hopefully not getting fired, I figured that there is no better time to go big and go on a trip around the world starting on May 25th. Fortunately and unfortunately, trips around the world don’t plan themselves, they require a lot of preparation. While I have met many travelers who have simply showed up in a country with absolutely no plans, they end up not seeing as much as someone who has planned ahead. The people without plans end up spending a considerable portion of their time doing research instead of enjoying the trip. Additionally, doing research ahead of time generally make you a well-informed traveler which will aid in any decision making on the trip. Here are all the steps and my timeline needed to plan a large trip. 1. Destinations (Feb-Early March): After deciding to go on a round-the-world trip or any big trip, the first step is to decide where to go. At this stage in the game, it’s best to pick generic destinations such as countries or notable cities rather than specific activites. For my trip, I knew I wanted to go to new countries in South East Asia, Africa, and the Indian Subcontinient, so I picked out 9 countries that would fit this itinerary. I also decided a vague idea of how long I wanted to spend in each destination- 3 days in Hong Kong, 1 month in India. My favorite websites for looking at travel destinations are TripBucket and WikiTravel. This is the dreaming phase. No plan is too grand or ridiculous at this point. Don’t discount any destination because it might just be possible. 2. Flights (Early-Late March): At this point, I was ready to book flights. Since I knew all the destinations and how long I wanted to spend in each place, I then browsed the Round-The-World Fares on the State Alliance and OneWorld Alliance websites. Unlike in the US, flights between certain cities don’t happen every day, so it important to be flexible. For example, I wanted to go to Dubai, but because of the partner airlines in Star Alliance, I had to go to Ethiopia instead as none of the Star Alliance members flew between India and Dubai (many other airlines fly that route). I used a travel agent for this step because I had to book 20 flights. However, if your big trip only involves a few flights, book it yourself using Kayak. Los Angeles- San Francisco- Hong Kong- Ho Chi Minh City – Hanoi – Da Nang- Ho Chi Minh City – Bangkok – Kathmandu – Bangkok – Chennai overland to Mumbai – Addis Ababa – Kilimanjaro – Dar Es Salaam- Johannesburg – Livingstone, Zambia – Johannesburg – Cape Town – Johannesburg – London – Los Angeles. Round-The-World Fares cost anywhere between $3,500-10,000 depending on your destinations, total mileage flown, class and the airline alliance. While this seems expensive, consider that a round-trip ticket from Los Angeles to Cape Town costs around $2,500. Now is when you should start to consider the costs of the trip. While many destinations would otherwise be too expensive to fly on their own, the Round-The-World fare makes these off-the-wall places, such as Easter Island, Pakistan, or Svalbard accessible. 3. Visas (Late March-Early April): Many countries, especially in the Asia and Africa require Visas in advance. This varies depending on your nationality, so make sure to look up each country’s visa policy and never assume that you can simply show up and get in. Some notable countries that require visas in advance are Australia, Brazil, China, India, Russia, and Vietnam. Visas can take up to 8 weeks to process, so leave enough time to get the visas. I used an expeditor service, which is pricy, but ensures you get the visa. The Indian visa was particularly nitpicky and I certainly would have not been able to obtain it without help from the expeditor service. 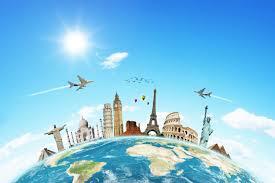 I used RushMyTravelVisa and they were great. 4. Lodging and Internal Transportation (Early April-May): Now its time to start the real planning. Now I had to figure out exactly which cities I wanted to visit and for how long. Saying “Vietnam for 12 days flying in and out of Saigon” isn’t enough now. Now I had to book hostels/hotels and figure out how to get between my destinations. This doesn’t mean that the itinerary is set in stone- you can always completely change your plans on the fly once you can see the situation. Still, it is better to arrive somewhere with a plan than no plan. For booking hostels, I always use HostelWorld.com, which provides a rating system and easy way to book hostels in almost any country (they were great for everywhere except for India). While a good rating on the site usually means that the hostel is good, I always cross-reference the hostel with either WikiTravel or a Lonely Planet guide. As a solo traveler or someone in a small group, backpacker hostels are the way to go. Not only are they cheap, but they give you the chance to meet other travelers from all over the world. You can share stories, get advice, and get groups to do things very easily. Meeting people in hostels is never a problem. Also every hostel has staff, who can help you plan activities for the day. They understand the backpacker budget and often run tours straight from the hostel. This is where you have to start checking into your budget. While a hostel in Berlin may cost $40-50, a hostel in Hanoi will only cost $7. Also check to see if the hostel has a kitchen. Cooking, while time consuming can help you save money and help meet people. There are a variety of ways to get around a country: internal flights, busses, trains, motorcycle, car rental. It is important to research all the methods of transportation before settling. For Australia last year, I bought and resold a car. For Vietnam, I am taking internal flights. For India, I am taking trains and long-distance busses. For Tanzania, I am taking public busses. No two countries are alike, so do research and talk to people who have visited these countries to determine the best way to get around. 5. Miscellaneous (Early April): At this point there are a few other issues that need to be resolved. The two most important are money and communication. It is impractical and risky to carry huge amounts of cash. The most secure way to get money is to withdraw it from a bank. However, banks often charge a fee for this service, which can be up to 6%, so figure out which banks are partners with your bank in America and go only to those banks. Another issue is communication both within the countries you are traveling and back home to the US. My original plan was to buy a cheap cell phone with a pay as you go SIM card in each country. However, my parents surprised me and bought me a phone with an international plan. This allows me to call both within the country and back to the US for a reasonable price. Still undecided on the issue, but I might also purchase a phone in India because I will be there for a full month. I also decided to bring my iPhone with me. This will give me access to the internet (via Wifi in hostels) and a camera. 6. Final Touches (Mid-Late May): Now with just 2 days to go before the trip, my biggest concern is the packing list. Key items on the packing list include the medical kit, which involved a visit to the travel medicine doctor. I also try to bring backups for anything important including iPhone chargers, trip itineraries, train tickets, and hostel confirmations. Another useful item to bring are earplugs, which are great in noisy hostels. I am really excited for this one-in-a-lifetime trip! I know that these months of planning will be well worth it. Have a great trip Bryce! Learn a lot of things so you can come back and teach us about living a little. I definitely will be using this and calling you for advice for any future travels. I wish you the best and safe travels!